If you wonder at night what are the top ten cities in the US that have seen monster home value increases over the past 30 years, then we’ve got your answers here. 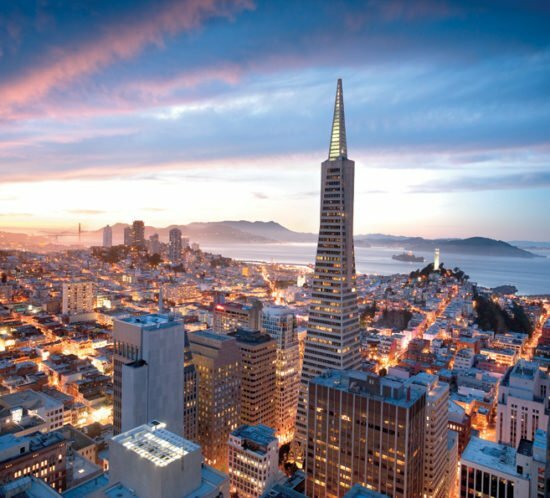 Three new reports (and accompanying graphics) just came out from Paragon Real Estate Group that reveal excellent buying opportunities in San Francisco. 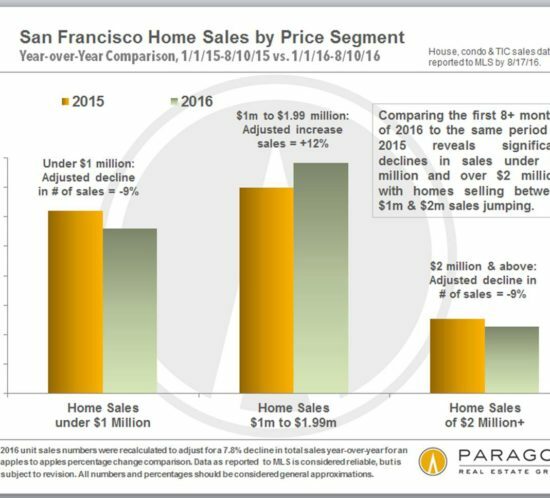 These are the much anticipated semiannual and update reports released by Paragon and if studied are a clarifying lens on SF’s neighborhoods and districts in terms of home unit sales. The information can be insightful for both buyers and sellers. Links to the reports are below. 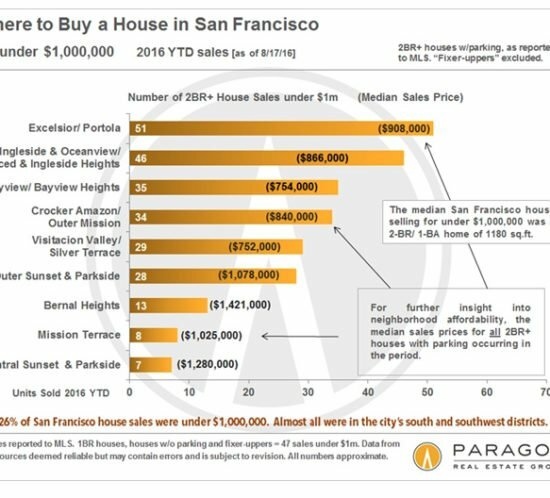 The reports cover: 8/16 semiannual analysis of where to buy in SF by price point; the 7/16 analysis (in tables) breaking down sales and prices by neighborhood and bedroom count: 7/16 district sales by price segment (in charts). The first two reports are more geared to buyers as they look at neighborhood by neighborhood opportunities. The third report will assist sellers in successfully setting prices that will move their property. Be careful to note that the median prices won’t be exactly the same from report to report as the time periods are different and some of the parameters are tweaked a bit—with or without parking, fixer uppers, or BMR’s excluded, etc. 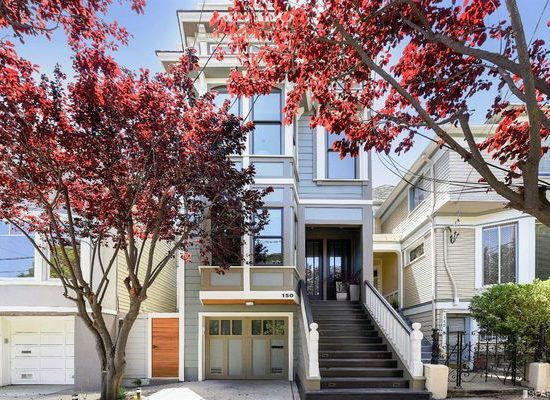 Another very overhauled Victorian house at 150 Vicksburg Street made the high for last week’s SF.curbed.com high and low list for weekly sales. Located in Noe Valley this Victorian used to have a hallowed reputation, one of the real classic beauties of the Valley. In 2013 it sold for $1.3 million and was a duplex. It just sold for $4.1 million, $300,000 less than the asking price. SFcurbed notes that these kinds of wide-swath renovations are still happening despite observers’ regrets because big money keeps chasing them. Rebuild a Victorian and they will come seems to be the catch phrase. The low side of home sales last week surprisingly came over in the Lower Pacific Heights neighborhood. At 1700 Gough Street, the number 408 apartment just south of Lafayette Park went for a low, low $450,000. And this was way up from the listing price of $390,000. The sellers couldn’t get any buyers for 2 months and after a buyer offered $450,000 then the deal fell apart the owner decided to keep the higher price. Perhaps needless to say, the apartment (built in 1980) is a micro micro studio, coming in at less than 260 square feet. In today’s home buying SF market just north of 1 million dollars is a good buy for 2 bedroom / 1 bathroom condominium residences. And that’s what 1 Franklin is offering right now. Their price range is $1,025,000 to $1,059,000 and if you’re looking for views with your million dollar residence, these have them. These are very good buys considering the average condo price is $1.1 million. 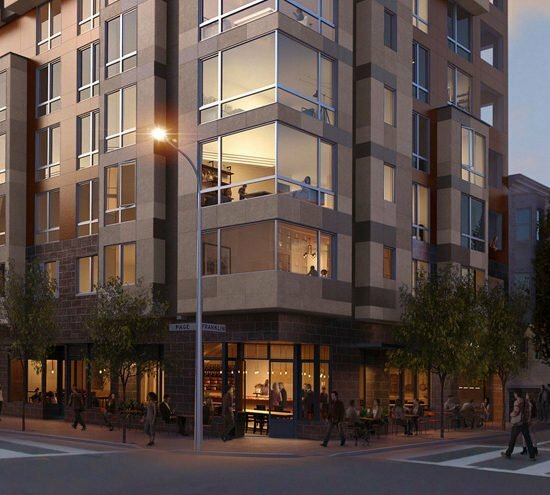 One Franklin is a smaller bespoke—eight stories tall—residency tower situated in charming Hayes Valley, right on a corner that abuts the Market Street corridor and The Mission. This makes the location very desirable as it is on the edge of Hayes Valley without being too far into the Valley’s busyness. It boasts 35 studio, 1 and 2 bedroom condos and the tower is outfitted with fine amenities, and has a 2nd floor courtyard and a deck and barbecue on the 6th floor. And for commuters there’s a very convenient public transit nearby and nearly immediate access to the freeway for driving to Silicon Valley. For bikers the building has bike parking and there’s also private storage. Click here to visit the onefranklinsf.com web site. Commuters into San Francisco from the East Bay coming in over the Bay Bridge are turning into farm-style early risers. And they’re angling to easily beat the later risers who are the later commuters. But 5 – 6 a.m. is now the new morning rush hour. 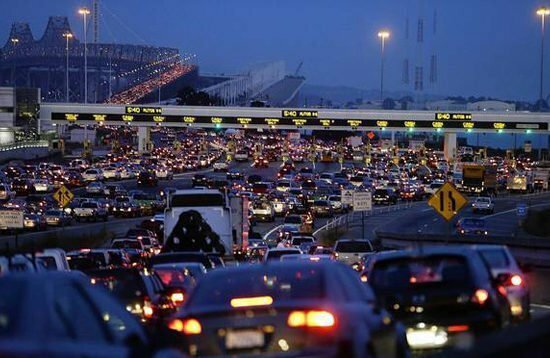 According to a new KCBS study of traffic patterns in the commute flow across the Bay Bridge 5 to 6 in the morning is the busiest time for morning crossings into the city. This goes against the conventionally held observation (based on traffic data by the Metropolitan Transportation Commission) that the real slow-and-crawl time for morning crossings is 7 to 8 am. That’s a shift of 2 hours earlier, and this corresponds with a 50% increase in traffic at earlier times over the past 5 years—with the busiest time in 2015 being the 5 – 6 slot. For the Bay Area’s other six bridges the busiest time is 6 – 7 a.m.
Additionally, the traffic going over the Bay Bridge into the city has increased 11% since 2010 and increased 2% alone in 2015. There has been a 75% increase in car traffic at the 5 – 6 a.m. slot compared to 2010-11. Prop. 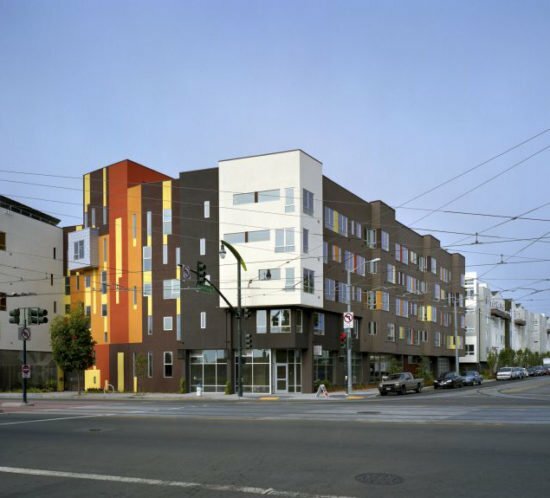 C’s 25% Affordable Housing in SF Too High a Target? Voters gave the thumbs up to a 25% figure for new housing for low income SF residents through Prop. C which passed this past June. Part of that proposition was the caveat that the SF Board of Supervisors could alter the 25% figure dependent on a feasibility study conducted by the city controller. Previously, the requirement for affordable housing was 12% with an allowance of variation if the housing was built onsite or if the developers paid a fee. So, effectively there’s been a doubling of the low income housing potential in the city. However, the city controller’s feasibility study has come in and on Monday, August 22nd, a team of consultants evaluating the study concluded that 25 percent may be too high a figure and could harm the entire housing development market. So far no changes have been enacted to the 25 percent figure. Final recommendations from the city controller’s office to the Board of Supervisors will be made next month. Land values are at the heart of the concern over the impact on the health of the housing market. The group of consultants determined that for apartment projects an 18% figure would work and a 20% target for condos would work. What? Yes, that’s right, believe it or not. 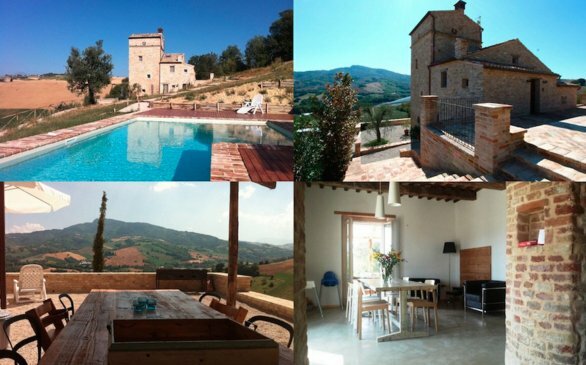 There are actual well appointed, enormously endowed with square footage, very old castles (some with watchtowers) in Europe that are cheaper to buy than an apartment in San Francisco. This fun comparison just shows that an apartment in San Francisco is a pretty heady buy—even if it’s in a less than stellar neighborhood. In the Midi-Pyrenees of France you can buy a French-style castle that sits on the foundations of a Roman outpost that has 7 sitting rooms, 9 bedrooms, 8 bathrooms, fountains, English garden, and incredible views for $2,659,569. In the Lower Haight you can buy for almost $2,995,900 a 3,438 square foot apartment unit that comes with copper plumbing and can be broken up into 5 private offices and 3 smaller apartments. 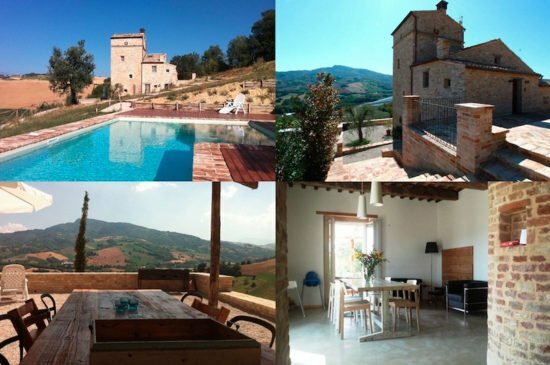 Down toward the lower side of purchasing power you can buy a castle in Marche, Italy that has a watchtower, giant pool and spectacular Tesino Valley views for $854,480. Over in Bayview you can purchase a 5-bedroom, 3-bathroom apartment for $869,000. No views. Comparing 2015 to 2016 as of August 10th, it’s looking like the sweet spot middle priced homes (from $1m to $2m) are rising in sales. 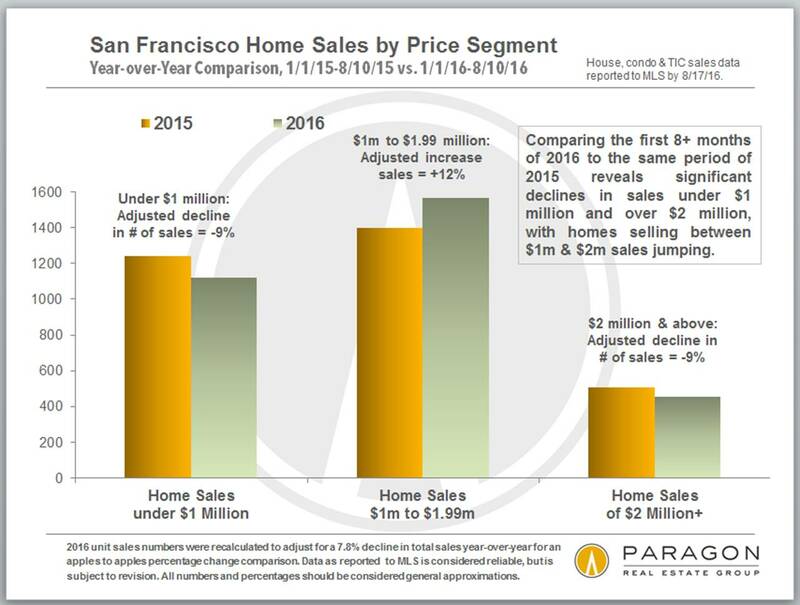 According to the Paragon Real Estate Group research as presented in the graphic below the higher prices home are still sluggish and tapering downward. The lower pricing category of homes has also decreased since 2015, yet the sales in the lowest prices houses are still good. The 2016 numbers below were adjusted to compensate for a year-over-year decline in unit sales of 7.8%. After doing this it is apparent that unit sales below $1m and above $2m both dropped by about 9%, while sales of homes in between jumped 12%. In our city famous for its artists and writers a new significant mural art was just unveiled this week in Hayes Valley. 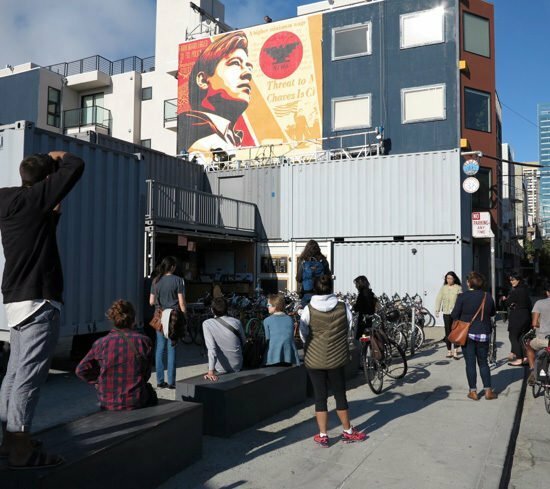 The mural was painted by world-famous activist artist Shepard Fairey on the side of a building on Linden Alley near a bike shop. The work is titled Worker’s Rights and was painted in a two-day exhibition of master craftsmanship. The mural (billboard size) depicts Cesar Chavez after he finished a 300-mile march to Sacramento—drawing attention to farmworkers’ rights. This mural is one of two he’s completing in the city, the two paintings drawn from well known images shot by photographer Jim Marshall. These two murals are part of his latest show called American Civics, which will feature five murals on what Fairey identifies as “abiding issues of our time.” These include gun control, voting rights, mass incarceration, income equality, and workers’ rights.